The redesigned Quattroporte will use a new version of a Maserati-designed and Ferrari-built 4.7-liter V-8. TURIN, Italy -- Maserati's redesigned Quattroporte flagship sedan, set to debut in January at the Detroit auto show, will launch Fiat-Chrysler CEO Sergio Marchionne's ambitious plan to reinvigorate the brand's sales. Marchionne aims to sell as many as 60,000 Maseratis globally by the end of the decade. Last year, the brand sold 6,159 units. The Quattroporte will be larger than the current version to better compete with such nameplates as the Audi A8 and BMW 7 series. Maserati also plans to unveil a mid-sized sedan in March at the Geneva auto show or in April at the Shanghai auto show. The sedan will be smaller than the current Quattroporte and will aim to compete with the Audi A6 and BMW 5 series. A third new Maserati, previewed by the Kubang concept, will be the company's first SUV. Production is scheduled to begin in early 2014 in the same Detroit plant that builds the Jeep Grand Cherokee. Engines will be shipped from Italy. To achieve economies of scale, Maserati's new sedans will borrow systems and parts from Chrysler sedans such as the Chrysler 300. The Chrysler parts, such as wiring, air conditioning and seat structures, will be out of sight so customers don't regard the new sedans as "Chrysleratis." Quattroporte: The redesigned Quattroporte will use a new version of a Maserati-designed and Ferrari-built 4.7-liter V-8. The engine will have direct injection, deliver about 475 hp and be coupled with ZF Friedrichshafen's eight-speed automatic transmission. All-wheel drive will be available with a new twin-turbocharged V-6. Maserati aims for 12,000 annual global sales of the redesigned Quattroporte, more than twice the current version's peak of 5,088 in 2007. Mid-sized sedan: Maserati plans a mid-sized sedan slightly smaller than the current Quattroporte. The still-unnamed sedan will be rear- or all-wheel drive. Its gasoline-powered V-6 will generate more than 400 hp and have direct injection and turbocharging. The sedan also will be the first Maserati to offer a diesel engine, a beefed up version of VM Motori's 3.0-liter V-6 used in Europe by the Jeep Grand Cherokee. Maserati says the new car's sticker will range from 55,000 to 70,000 euros in Europe. Maserati plans to build 20,000 to 25,000 units a year. Large SUV: Chrysler Group will build the SUV, a sibling of the Jeep Grand Cherokee, in the Jefferson North assembly plant in Detroit. The Kubang concept, shown in 2011 at the Frankfurt auto show, previewed the vehicle, but the production version will have a different name. Maserati expects global sales of 20,000 to 25,000 large SUVs a year. Maserati CEO Harald Wester declined to disclose a price for the vehicle, set to compete with the Porsche Cayenne, Range Rover Sport and upcoming Bentley SUV. 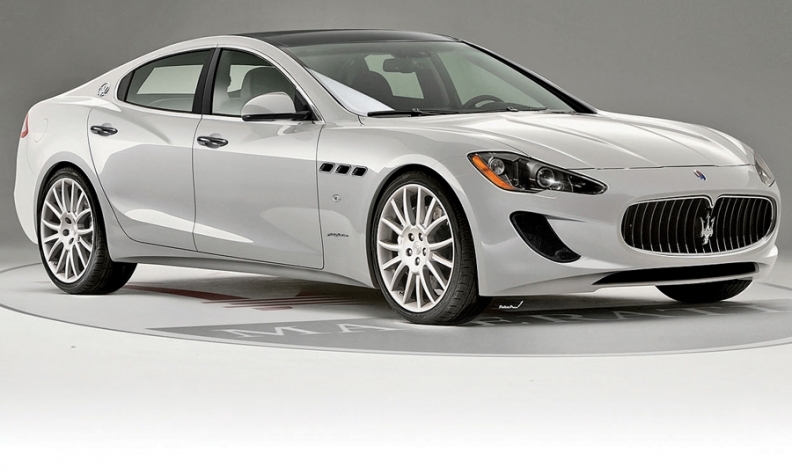 The gasoline engine will be Maserati's new 475-hp 4.7-liter V-8 coupled with ZF's eight-speed automatic transmission. The large SUV also will offer a high-output version of a VM Motori V-6 diesel that could peak at 350 hp, according to Italian press reports. GranTurismo: The four-seat coupe is scheduled to be redesigned in 2015, sharing its underpinnings and powertrain with the redesigned Quattroporte and the new mid-sized sedan. GranTurismo Convertible: Maserati does not plan another four-seat convertible with a soft top. Instead, it eventually plans a hard top version of the next GranTurismo coupe.